A prolific songwriter in his own write, Charlie has also been a great interpreter of other writer’s work putting his unique stamp on everything he sings and plays. Highly influenced as a young man with great wordsmiths and the storytellers of the day, you can hear in his original works shades of fellow Minnesotan Bob Dylan, John Prine, Townes Van Zant, Leon Redbone, David Bromberg, Jesse Winchester, Greg Brown, Jerry Jeff Walker, and Waylon Jennings to name a few. 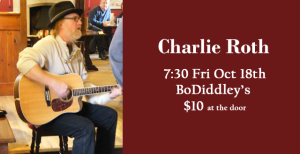 Today Charlie has found his own voice and continues to grow as an artist finding inspiration, influencing, and being influenced by his contemporaries.